This blog post is taken from Baratza's own website. 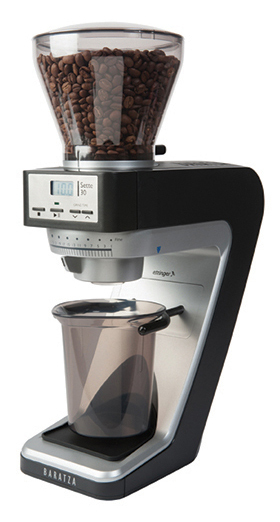 It highlights the differences and lets you be informed about which grinder is perfect for you. So you’ve started your journey down the rabbit hole of coffee. By now, you’ve probably heard that the first, biggest improvement you can make for great coffee at home is a good burr grinder. Our grinders serve a variety of needs: all-purpose workhorses like the Encore and Virtuoso won’t break your budget, next-level precision like the Vario and Vario-W will up your game for espresso and brew, and cutting edge technology like the Sette series will elevate the home espresso experience. We find that most users are looking for certain things from a grinder: great espresso, consistent pour-overs, or just plain daily coffee grinding. It’s a big decision. In order to make the right choice, it helps to figure out what you’re looking for first. I just want to make great coffee at home. Encore and Virtuoso are great choices for you. These machines are Baratza’s tried-and-true grinders, and get the job done for just about anybody. Whether you’re a novice coffee drinker or a seasoned barista, these machines are a great fit. I want my coffee at home to taste as good as the pour-overs my barista makes. You buy great beans from your favourite roaster, but somehow the coffee just doesn’t taste as good at home. This is a common frustration for home-coffee enthusiasts, and the solution is to arm yourself with the same tools your barista uses. Home Espresso – Where Do I Start? You’ve just bought your first espresso machine, and you need a grinder that won’t let you down. There are a few good ways to get started with home espresso. You’re no novice when it comes to espresso. You have the right machine and the knowledge it takes to extract like a pro, and it only makes sense that you have a professional grinder. 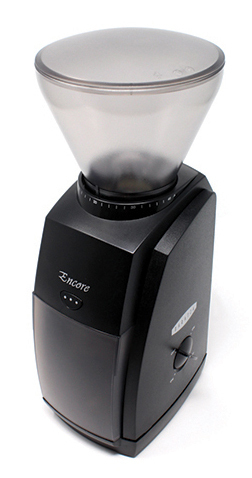 Our entry level conical burr grinder is the Encore, at $139 MSRP. It has 40 steps of adjustment that span from espresso to French press. The Encore has a pulse button on the front of the machine as well as an on/off toggle on the side. It carries a small footprint and fits nicely under most kitchen cabinets. This machine is great for those who want fresh ground coffee that is consistent (and easy to produce thanks to a set of high-carbon steel, 40mm burrs). However, if you plan to dive deep into extraction – especially on espresso – the Encore may not be your best choice. It also grinds the slowest of all our machines at about 1 gram per second. The Encore is a great first step into the world of fresh ground coffee at home. The Virtuoso is a step up from the Encore with an MSRP of $229. With an attractive metal upper casing and base, this grinder immediately catches the eye. 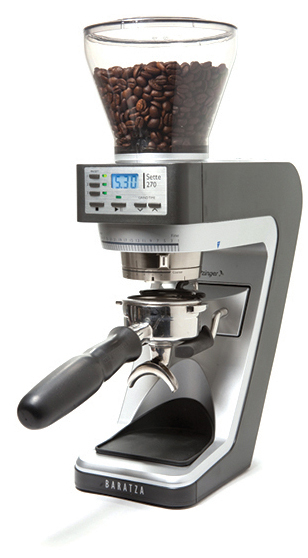 Its advanced burr set excels at a consistent coarse grind and readily produces an espresso-fine grind. Additionally, the Virtuoso boasts a throughput rate of 2 grams per second – twice that of the Encore. Like the Encore, the Virtuoso has a pulse button, but on the side, you’ll find a timer switch that offers a distinct advantage over the on/off switch of the Encore. The timer allows the user to roughly dose their coffee. It winds down, powering off the grinder at the end of the timer cycle. The Virtuoso was released in 2005, and there’s a reason this model is our longest in production; it’s an advanced, consistent, and reliable machine. It provides the best “bang for your buck” out of our entire lineup and is a favourite among coffee professionals and enthusiasts alike. Ask your barista what grinder they have at home – chances are, it’s the Virtuoso. The Vario is a serious choice for great coffee at home. 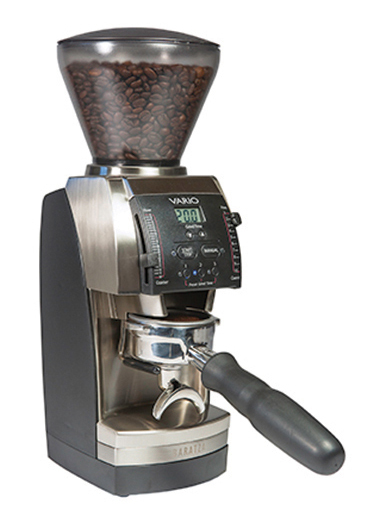 At $479 MSRP, the Vario is the intersection of grind performance and user control. Flat, ceramic burrs produce an exceptionally consistent grind at fine and medium settings. The optional steel flat burrs provide the absolute best coarse grind on any Baratza grinder, rivalling some of the best commercial coffee grinders on the market at a fraction of the price. 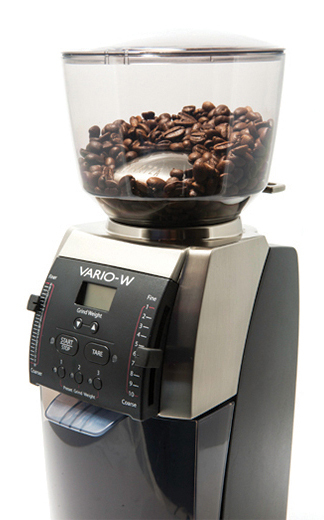 The Vario is equipped with a micro/macro adjustment system that allows for very precise grind size regulation. This is the feature that makes it possible to produce coffee at a professional level in the home. The Vario has a digital display; the user can dose manually, or by choosing one of three timers presets. Each timer is saved into the display and can be set to the tenth of a second. The Vario comes with a higher-capacity grounds bin than our Conical grinders but set it aside to use the metal portafilter holder, included with every Vario. This accessory allows for grinding directly into a portafilter, with a funnel that reduces mess and static during the grind. The introduction of grind-by-weight technology revolutionized coffee service in the professional sector, but you don’t have to work in coffee to experience its convenience and precision. At $559 MSRP, the Vario-W brings the same burr set and micro/macro adjustment system found on the Vario, but replaces timer-based operation with three adjustable and precise weight presets. Choose your dose by the gram, and the Vario-W will grind as much coffee to within 0.2g. This level of accuracy comes at the cost of capacity; the Vario-W can’t hold heavy objects like a portafilter, so it only comes with a high-capacity (120g) grounds bin. Also included is a hopper with a shut-off gate, allowing for easy removal of a full hopper without making a mess. Install the optional steel burrs and the Vario-W provides coffee-shop level performance and functionality for the pour-over fanatic. It’s not uncommon to see Vario-W’s in use at pour-over bars and small coffee shops. “A zero waste grinder will actually pay for the grinder within one to two years in coffee savings, or perhaps even less.” – Mark Prince, CoffeeGeek. The Sette 30 AP is our entry-level espresso grinder at $269 MSRP. The user who is serious about espresso but not ready to make a bigger investment is well suited to this grinder thanks to its intersection of affordability and innovative technology. The Sette features our radically redesigned gearbox and burr set in which the outer ring burr rotates around a stationary cone burr. This design allows for high-speed grinding – up to 5g per second – as well as minimal retention of coffee in the system. Most burr grinders utilize a small pathway through which ground coffee travels. On the Sette, coffee simply falls from the burrs down into your portafilter. The mouthfeel and flavour clarity of espresso made using the Sette out-classes other home espresso grinders, and the robust feature set of the Sette 30 AP makes it easy to dial-in consistently. The machine has a digital timer with a resolution to the tenth of a second so that you can precisely control how much coffee you use. Cleaning the Sette is as easy as it gets on a Baratza: just shut the hopper gate and remove the cone burr. This gives you easy access to the ring burr as well as the cone burr and holder. This machine has 30 steps of adjustment that span from espresso fine to a medium-fine for small pour-overs. Although the Sette 30 AP lacks the micro-adjustability found on the Vario, Forte, and other Settes, dialling in is still a simple process for the beginner. More advanced users can also fine-tune excellent extractions with other modifications to brew ratio. We explore this further in a previous post. The Sette 270 introduces a revolutionary design to home espresso grinders, bringing professional functionality to home users at $399 MSRP. The mouthfeel and flavour clarity of espresso pulled on the Sette out-classes other home espresso grinders. The density of features offered by the Sette makes dialling in espresso simple and hassle-free. Thirty steps of macro-adjustment and a fully step less micro-adjustment system gives the user has a near-infinite number of grind settings to allow for the best, most precise dial-in on any Baratza grinder. This allows room for even the most attentive taster to explore delicate layers of sweetness, acidity, and body for all types of espresso from classic Italian dark roasts to progressive light roasts. The grind quality on the Sette covers a wide breadth of espresso styles from dense, syrupy shots to high-yield, tea-like extractions. The Sette excels at fine grinding up to and including small, single-cup pour-overs. When it comes to coarser grinds as you might want for a Chemex or another large manual-brew device, this machine won’t provide the consistency of our flat-burr grinders. That means brewing with these methods will take a little finesse, which we explore in another post. If you like a traditional, balanced cup of coffee that is body-forward, the Sette is a good fit! The Sette features our radically redesigned gearbox and burr set in which the outer ring burr rotates around a stationary cone burr. This design allows for high-speed grinding – up to 5g per second – as well as minimal retention of coffee in the system. Most burr grinders utilize a small pathway through which ground coffee travels. On the Sette, coffee simply falls from the burrs down into your portafilter. The machine is equipped with a digital timer that holds three adjustable presets. This allows you to save three different doses for a variety of uses. The Convertible Device Holder is capable of securing a wide variety of portafilters and brewing devices (as well as the included bin) directly below the burr set for the quick and easy transfer of coffee. Cleaning the Sette is as easy as it gets on a Baratza: just shut the hopper gate and remove the ring burr/adjustment ring assembly. This gives you easy access to the ring burr as well as the cone burr and holder. The Sette 270 Wi introduces two revolutionary design innovations to espresso grinders and enables incredible functionality for home users at $579 MSRP. This machine is the first – and currently, the only – espresso grinder offering grind-by-weight functionality directly into a portafilter. Precise, accurate dosing to within a few grams (2- 3 beans!) directly into your portafilter makes quality, consistent espresso a breeze. The mouthfeel and flavour clarity of espresso pulled on the Sette out-classes other home espresso grinders. The multitude of features offered by the Sette makes dialling in espresso simple and hassle-free. Thirty steps of macro-adjustment and a full step less micro-adjustment system gives the user has a near-infinite number of grind settings to allow for the best, most precise dial-in on any Baratza grinder. This allows room for even the most attentive taster to explore delicate layers of sweetness, acidity, and body for all types of espresso from classic Italian dark roasts to progressive light roasts. The Sette excels at fine grinding up to and including small, single-cup pour-overs. When it comes to coarser grinds as you might want for a Chemex or another large manual-brew device, this machine won’t provide the consistency of our flat-burr grinders. That means brewing with these methods will take a little finesse, which we explore in another post. If you like a traditional, balanced cup of coffee that is body-forward, the Sette is a good fit! If you prefer a more progressive coffee experience – exploring delicate layers of sweetness and acidity – then the Sette is not your brew grinder. Most burr grinders utilize a small pathway through which ground coffee passes. On the Sette, coffee simply falls from the burrs down into your portafilter. 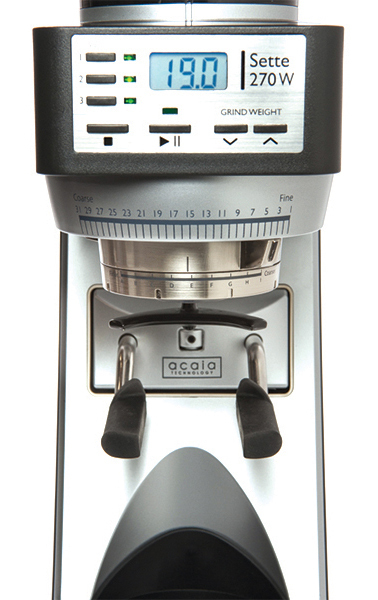 The machine is equipped with a digital scale utilizing Acaia technology that holds three adjustable and precise presets. This allows you to save three different dose weights for a variety of uses. Acaia’s scale technology includes Bluetooth connectivity so that you can pair your Sette 270Wi with Acaia’s Sette Updater app on iOS to ensure timely updates if a change to the software is made. The inclusion of Acaia’s user interface software makes the Sette 270Wi even more powerful for the home barista. The i in Wi stands for intelligent – the machine will learn from its own dose errors and modify the amount of coffee it produces with consecutive grinds. The result is greater accuracy over time. 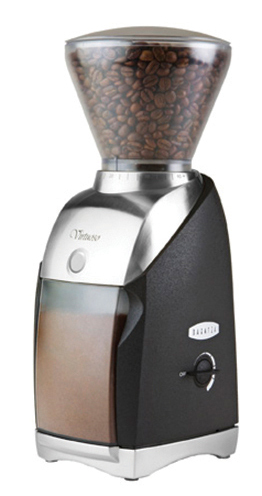 This powerful functionality makes the Sette 270Wi an advanced, data-forward coffee grinder. The Convertible Device Holder is capable of securing a wide variety of portafilters and brewing devices (as well as the included bin) directly below the burr set for the quick and easy transfer of coffee. Designed as a commercial solution for low-volume cafes, the Forte AP is a rock-solid espresso grinder with high-capacity and feature-density. 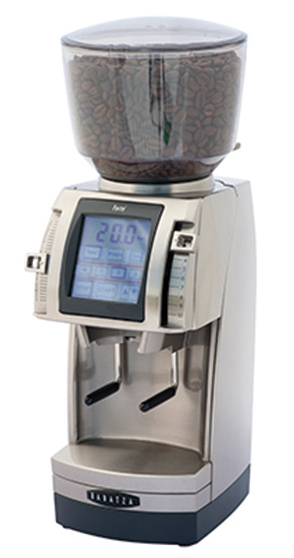 Operated by a touch screen, the Forte AP has two grind modes: by time and by weight. Each of those modes carries three presets and a manual option, giving you plenty of ways to conveniently switch from one dose to another. Grind by weight on the Forte does not work with the included portafilter holder accessory, though in exchange you get convenient coffee delivery into a portafilter as well as reduced mess thanks to a funnel which guides coffee grounds into the basket. This machine is a great choice for highly consistent espresso at home, although it’s better suited to commercial use. If you have dreams of opening a coffee shop, the Forte AP can help make those dreams come true. Its small footprint, multifunction touch screen, high daily capacity (5lbs per day) and sturdy grind size adjustments make the Forte AP a great choice for low-volume espresso in the café like decaf or single-origin offerings. Included with every Forte are a shut-off hopper and burr removal tool for easy cleaning and a simple burr calibration tool for quick QC calibration. This is the grinder your barista uses to make those pour-overs you enjoy at the café. Designed as a commercial solution to multi-offering pour-over bars, the Forte BG is a feature-forward, high-capacity, near-bulletproof machine with an MSRP of $970. If you want great pour-overs at home, you don’t really need the Forte BG, just its burr set, which is the same steel set available as an option on the Vario and Vario-W. If you have dreams of opening a coffee shop, though, the Forte BG can help make those dreams come true. Its small footprint, multifunction touch screen, sturdy grind size adjustments, high daily capacity (5lbs per day) and grind-by-weight functionality make the Forte BG the premier choice for a brew bar. High volume coffee bars across the world use arrays of Forte BGs to provide multiple brewed offerings at a time. Load each machine with a different coffee, and you’re just a touch away from brewing up a fresh order for your customer. This makes it possible for cafés to provide greater options for their customers without sacrificing workflow and efficiency for their baristas. 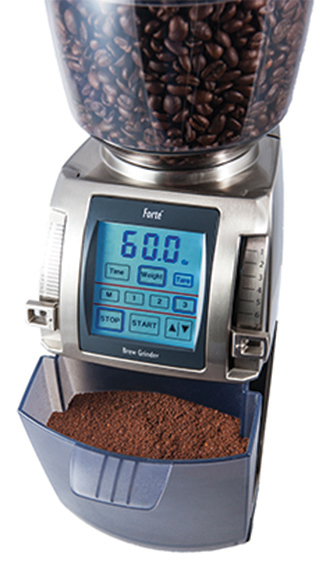 Included with every Forte are a shut-off hopper and burr removal tool for easy cleaning and a simple burr calibration tool for quick QC calibration. Previous article What are the best coffee grinders?